Hi everyone! 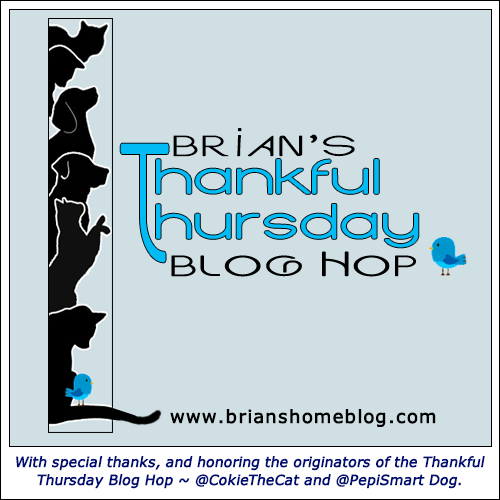 We are joining Brian’s Thankful Thursday Blog Hop. I want to thank you all for the comforting words and prayers you left for me for the loss of Tallulah. Thank you to all who featured her on your blogs too. I also want to thank Ann of Zoolatry for the beautiful graphic. And thanks for Pipo’s Mom for the 2 wonderful cards she made. And to The Kitties Blue’s Mom for this pretty graphic. St Francis said, “Come little one, there is nothing more I can do for you here, don’t be afraid”. St Francis gently picked up Tallulah and carried her into the kingdom of heaven, and when the little cat looked around, she realized everything St Francis told her on her journey was true….heaven was beautiful beyond what mere words could express. Tallulah saw there was no pain, suffering, fear, sickness, hunger, thirst or sorrow, until she looked down and saw the family and friends she had left behind, and for a very brief moment, the little cat too, was filled with sorrow. I apologize if I forgot anyone. Please let me know if I did. I am truly blessed to have so my caring people in my life. I must be having a dream. can’t you see the bananas and strawberry? Here are the Friendly Fill-Ins for tomorrow. Mom came up with the first two and our co-host, Lorianne of Four-Legged Furballs came up with second two. Thank you Lorianne for running the hop without me last week, you are an excellent co-host. 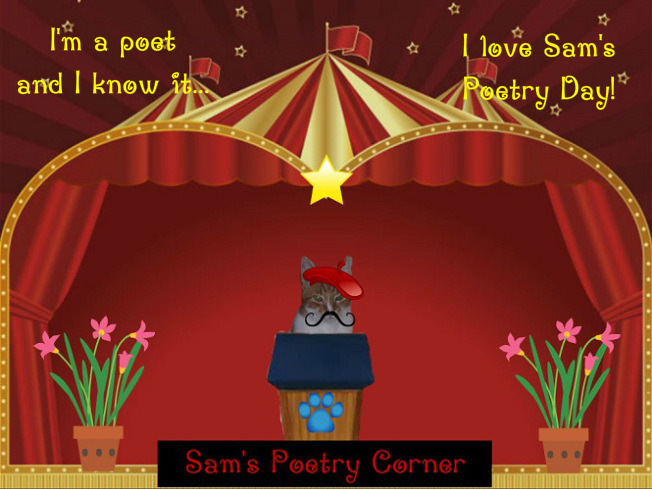 This entry was posted in Blog Hops and tagged Brian's Thankful Thursday Blog Hop, Sammy's Poetry Day, Tallulah, thank you by pilch92. Bookmark the permalink. And we are thankful to have known Tallulah if only virtually. She was pretty and much loved. That bowl of yummy naughtiness makes us drool! Of course the fruit justifies all the rest, MOL! We are going to answer the fill ins now, since petcretary s going to be busy over the next few days. 1. Superbowl Sunday is always on my weekend to be at work. 2. long technological explanations bore me and make my head spin to boot. 3. If you have love, you have everything. 4. My skill set could get me a job at a hospital, but I do not want to work 12 hour shifts. Big hugs and purrayers awnty Ellen. We’re so blest to have you in our lives. So happy to see you back……..we know how hard it is to come back after a sad loss in the family. Love your poem today – that banana split is simply heavenly looking but of course full of stuff we kitties can’t have (and my Mom says she “shouldn’t” have) but it sure looks yum. I wouldn’t mind a bit of that whipped cream anyway. Sending hugs………. Thank you. XO and love to you and your mom too. The St Francis poem made me cry. The other day I found a Toby whisker, even after a lot of cleaning and vacuuming. I’d like to believe he used his new wings to sneak back and leave it for me. We re glad to see you back too. It really is so hard to lose our fur friends. That desert sure looks yummy. And a great poem too. SUch a cute cat and savory sweets! Those are beautiful tributes to sweet Tallulah and the Tabbies brought wet to my whiskers again. Thanks for joining the Thankful Thursday Blog Hop! We’re so happy to see you back. Beautiful tributes to Tallulah. How lovely. I put your baby in my Angels in my navigation bar. Love your poem and love the questions for tomorrow. I’m all ready to go. Thank you for including Tallulah in your sidebar. Oh, bless your heart. Take care, my dear. Tallulah will forever be in your heart, Ellen. She’s chasing leaves with the angels now. Purrs and hugs to you and yours. What a lovely poem for Angel Tallulah; it’s purrfect! We used to have a restaurant chain around here that made mountains of ice cream scoops, covered in hot chocolate, whipped cream, and everything else. This image reminded me of the olden days. You are very fortunate to be surrounded by so many caring people. Each of these tributes is beautiful. Thank you. I am blessed. Welcome back. We hope you are all doing OK after your very sad loss. That’s so lovely, the idea of St. Francis meeting our lost pets and reminding them of the bonds of love. Of course your dessert is healthy — milk! chocolate! fruit! Wow, what a beautiful poem. Those are all beautiful cards for Tallulah. I like your poem. Of course it must be good if it has fruit in it! What beautiful cards and graphics. Tallulah was so pretty, and of course she reminds me of our Sam. 1. Super-Bowl Sunday does not mean a thing to me. I used to like the commercials, but even they don’t tempt me any longer. 2. Pro football bores me. 3. If you have love from family or friends, you have everything. 4. My skill set could get me another job with areas in government. That poem is exquisitely beautiful. We are so sorry about Tallulah. She was a beautiful girl. Purrs…. ohhh our hearts are so sad for you. The Bridge has received one more beautiful soul. Sending you our love and strength. Thank you. XO and love to you all. Beautiful tribute to your little girl. Such lovely ways to remember Tallulah. Our thoughts and purrs continue to be with you. Tallulah will get daffodils planted for her here. It is good to see you are blogging again. We send continued purrs. I just love all of these memorial images for Tallulah. What a beautiful angel. And that St. Francis poem is also so beautiful. St. Francis is a favorite of mine, and I bet Tallulah is keeping him wonderful company. And, as always, your poem made me smile! Purrs, prayers, and hugs to you.